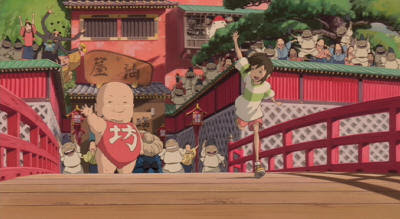 Ghibli Blog: Studio Ghibli, Animation and the Movies: Yaaaay!!!!! Back Online! Ohayoo, minna-san! The internet's back on! The car works again! Now I can drive it into a ditch. And wouldn't you know it, I've got a million things to do. D'oh! I really should've taken the day off, but I need the overtime pay for the May 1 move. Oh, and I need a new driver's license, I need to hunt for a really good apartment, do the laundry, add screenshots to all the recent posts, catch up on the Videogames of the Damned blog, and continue to hunt for valuable vinyl records. That Sundazed vinyl copy of Highway 61 Revisited - in the original mono mix - isn't gonna play itself. Oh, and I've got a pile of posts to continue here as well. But, at least I can write from my own desk again and fill up the blog with as many screenshots as I want.